With a four-day Thanksgiving weekend and no significant family obligations to worry about, you can usually expect to find me on the road. 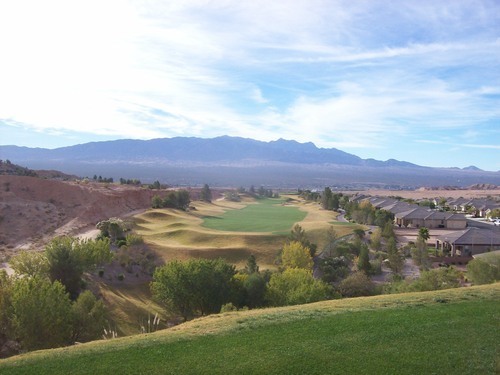 That was certainly the case this year, as a friend and I decided to head up to Mesquite, Nevada, which when paired with nearby St. George, Utah, has grown into one of golf’s most popular destinations. We hit the road on Wednesday afternoon and thankfully avoided any major traffic incidents on one of the busiest travel days of the year. We stayed the night in Las Vegas at Luxor, but were ready to roll Thursday morning to make the rest of the trek (about 90 more miles) to Mesquite. 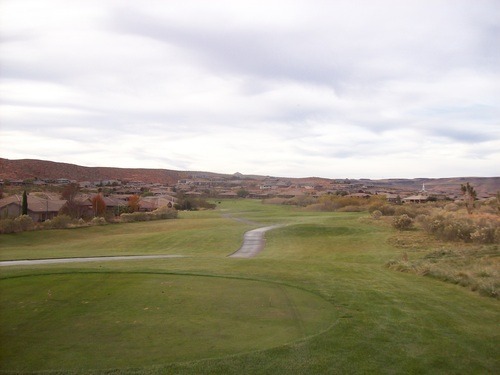 Since it was the holiday, every course in Mesquite had a mid-morning shotgun start and then closed early. 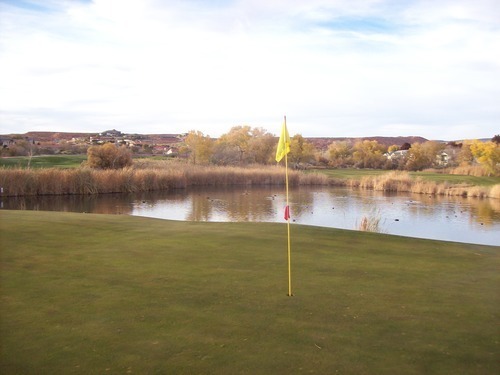 We found a great deal on TeeOff.com for the Falcon Ridge at 8:00, so we locked that in as our first round. With a promo code, it ended up being around $40 each when others were paying upwards of $80, so that was an easy decision. 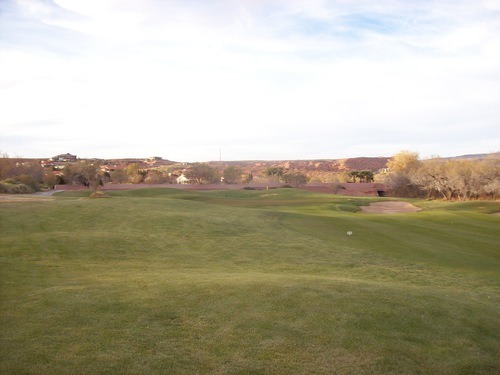 We were paired with another twosome and started on the par-3 5th hole, which is one of the easiest on the course. 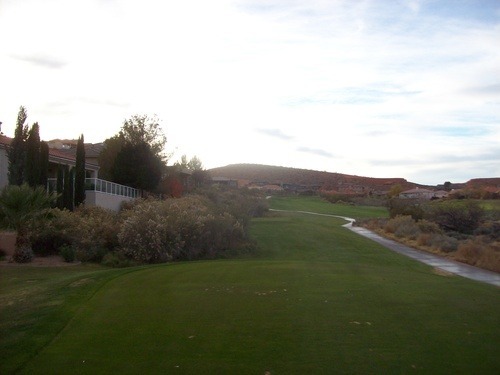 However, it’s always a little tough getting started on a par-3, especially on a chilly morning. 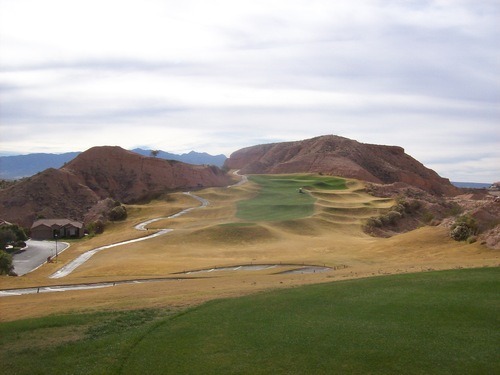 Of course, the dramatic 6th hole is easily the best one on the front nine! 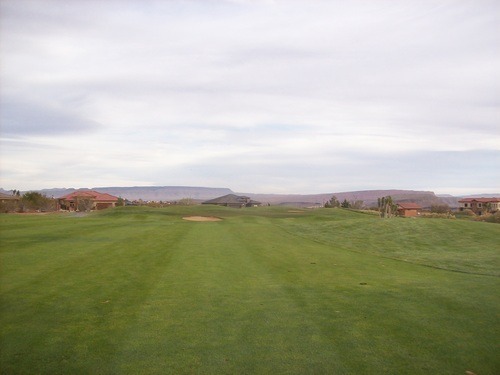 Still, I am glad we started on the front nine because it is definitely the “tamer” side of the course. 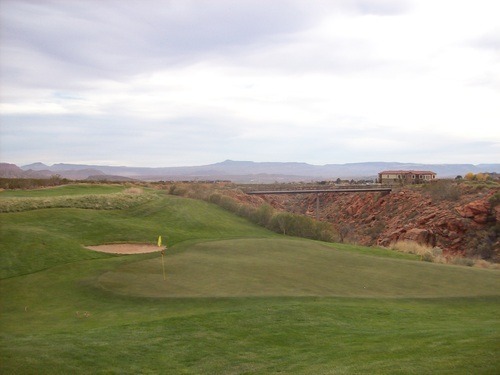 It’s a great, beautiful and fun layout all around, but the back nine is where things get most interesting at Falcon Ridge. 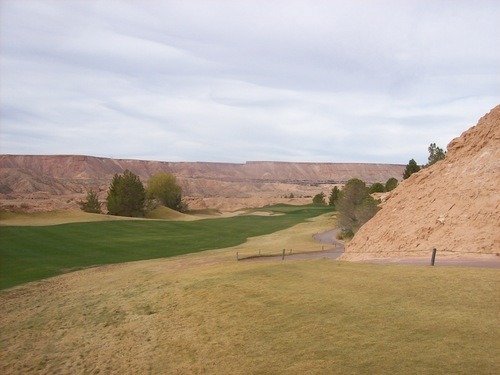 It winds its way through and along some small canyons and offers some very scenic and dramatic hole designs. 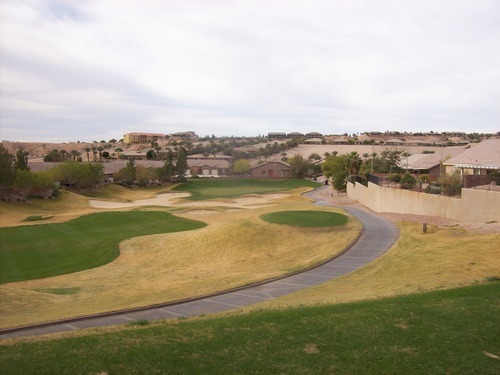 Some might say a few of these holes are a bit too “funky” as it is mostly true target style golf and there are a number of blind shots to contend with. 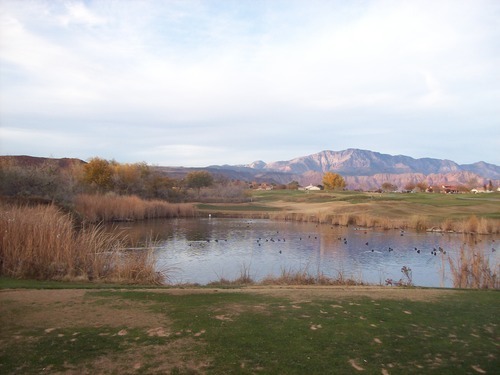 Local knowledge is beneficial throughout Falcon Ridge. 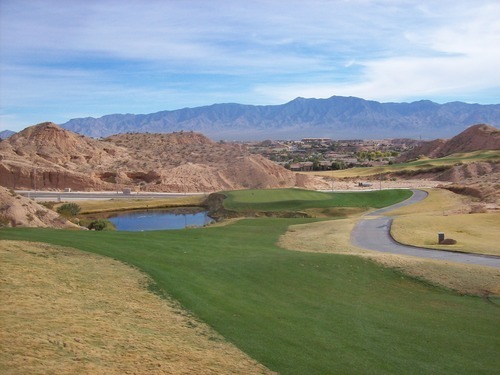 The guys we were paired with did have some experience here and that helped along with the GPS system in the cart. However, this is still a place you probably have to play several times to really figure out the right strategies for yourself. 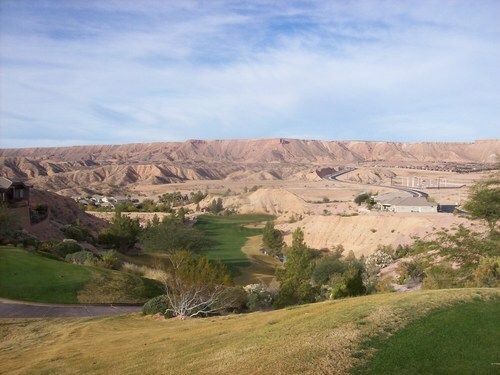 After this trip and my previous experience at Wolf Creek, that seems to be the case at most Mesquite courses. 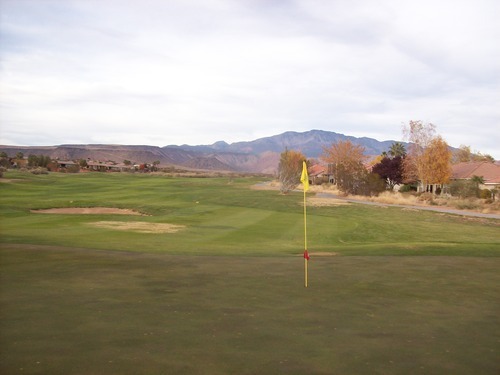 Another common trait is really tricky greens that are tough to read. 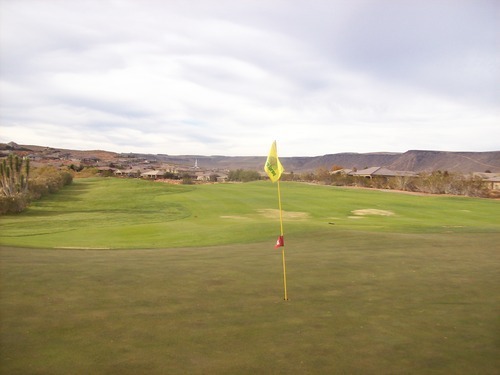 Falcon Ridge was probably my best putting performance as I drained a couple long ones, but there was still a lot of subtle deception on these putting surfaces. 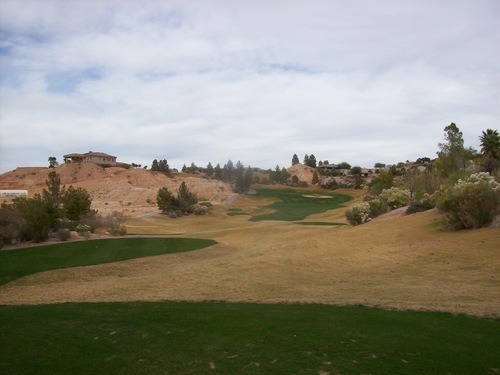 One unique trait of Falcon Ridge is the fairway cuts. 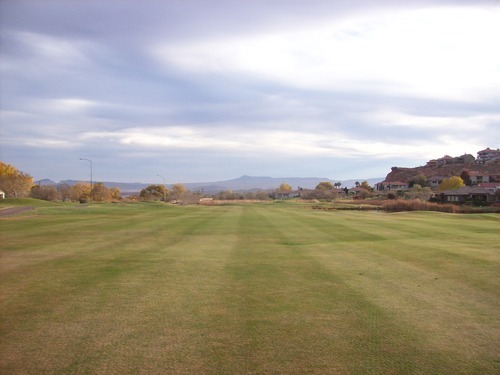 There are some holes that have small strips of auxiliary fairway landing areas and others with different splits and “fingers” that splay off in different directions. Not all seem to have a purpose, but it’s an intriguing look and adds some forgiveness. 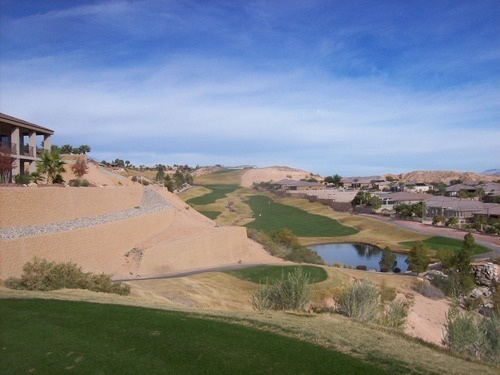 Overall, I would say the course is more forgiving than it looks as long as you stay out of major trouble. That’s often easier said than done, though. The highlight hole in my opinion is the par-5 12th, which is a real beauty. 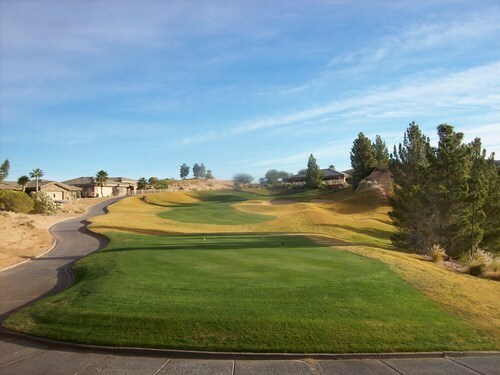 It features an elevated tee shot, a big dogleg right and a couple of risk/reward decisions. 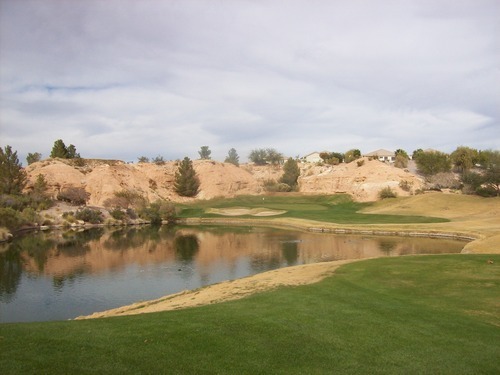 Shorter hitters like me can potentially go for the green with a well-placed tee shot at the end of the first fairway, but it will be around a 200-yard shot directly over water without much room for error. 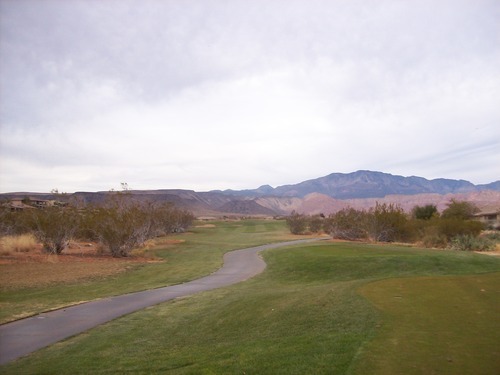 Longer hitters can try to reach the second stretch of fairway, but it’s a very narrow landing area. However, they would be rewarded with a much shorter approach. 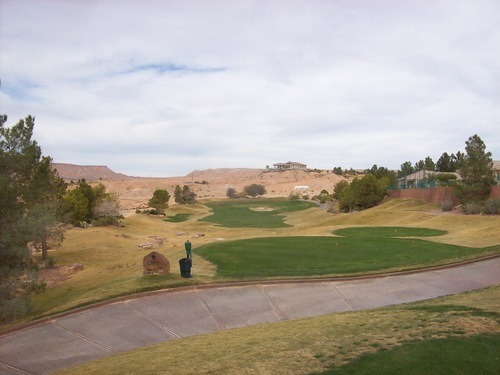 Most will probably choose to stay conservative by keeping it in the first fairway and dealing with that 200-yard shot. If you are hitting a 4- or 5-iron, I’m sure that shot is much less intimidating than me thinking about pulling out the 3-wood! 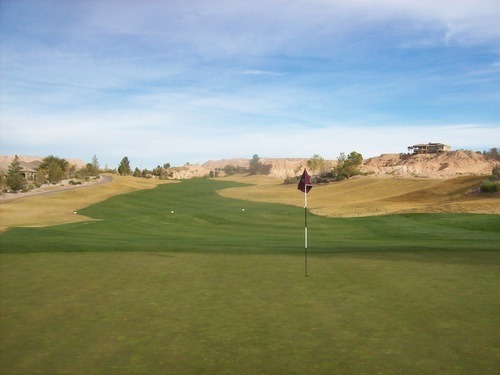 Falcon Ridge was in good winter shape overall. 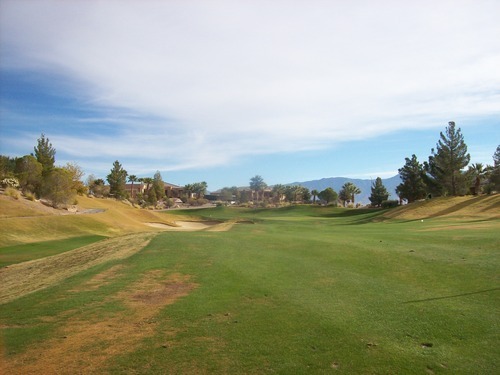 The tee boxes and fairways were lush and green with mostly excellent surfaces to play from. The rough was dormant, matted-down bermuda that is deceptively tough if the ball sits down at all or you have to hit against the grain. 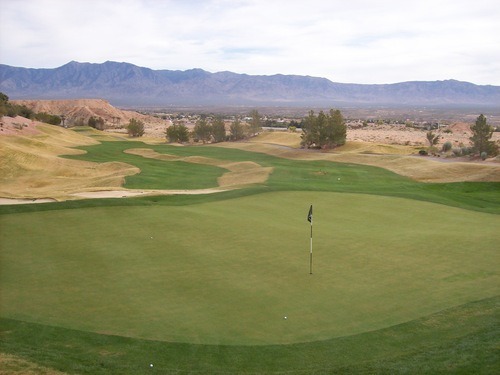 The bunkers were fine and the greens were good—a bit firm and rolling at medium speeds. 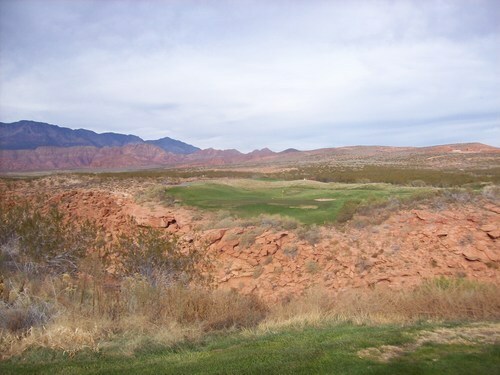 Falcon Ridge is not Wolf Creek, and I’d probably put it a notch below Conestoga, as well (you’ll see that review in my next post), but it is well worth the visit and I wouldn’t hesitate to recommend it to anyone taking a trip to this region. We hit the road with no time to think (or eat) as we wanted to try getting in another full 18. 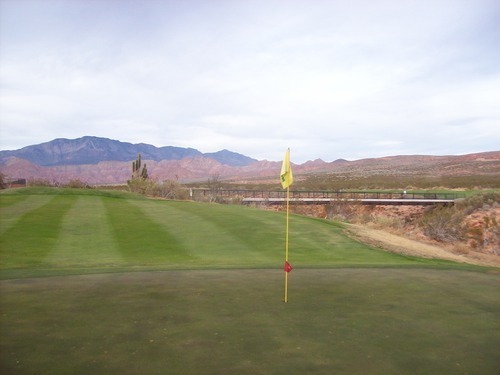 The time zone changes as you pass through the small sliver of Arizona there and into Utah, so it was around 3:00 Mountain Time as we arrived at this course. 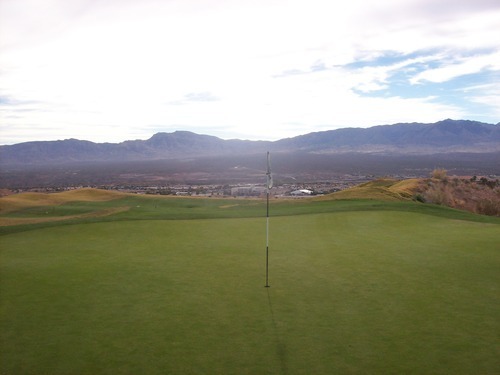 It was pretty empty at this point on Thanksgiving, so it seemed promising we’d get in a full round. The price was $29 for a twilight rate, which included a cart (gas-powered). We played as quickly as we could and played around a few other people, but ultimately finished the round in about 2.5 hours and with just enough daylight. 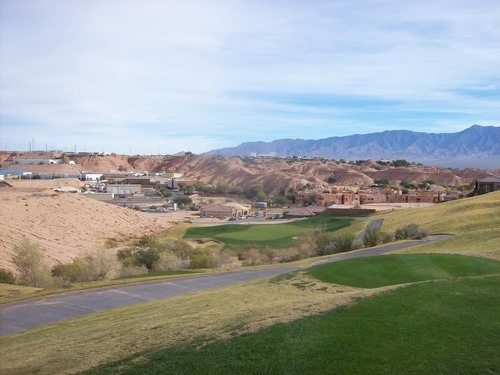 Admittedly, we played so fast and furious that it was hard to fully appreciate the course. Also, the weather was a little gloomy and the local scenery didn’t shine as much as it normally does, but we both walked away with a positive feeling about it. 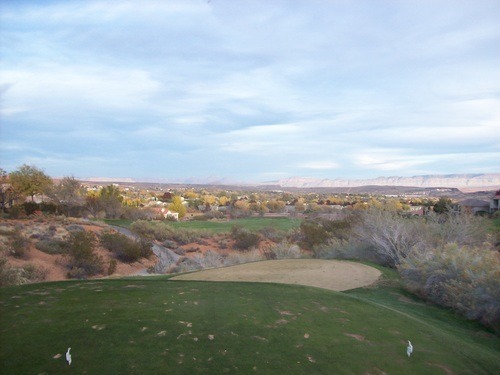 I didn’t know much about this course heading in as it was still a little lower down on my St. George “wish list.” Of the three I’ve now played (including Coral Canyon and Sand Hollow), Green Spring still would rank a distant third, but it goes to show the high quality of golf in this region because this is a course that doesn’t get as much word of mouth as others. 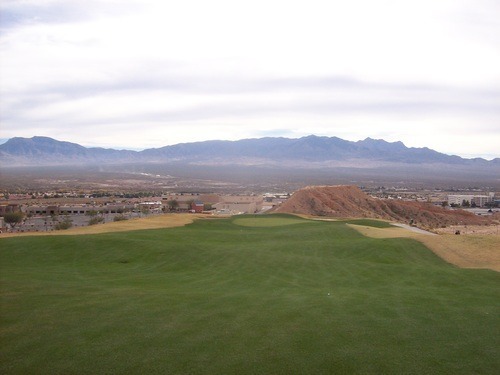 The first few holes at Green Spring were very bland and most of the front nine isn’t anything that special. 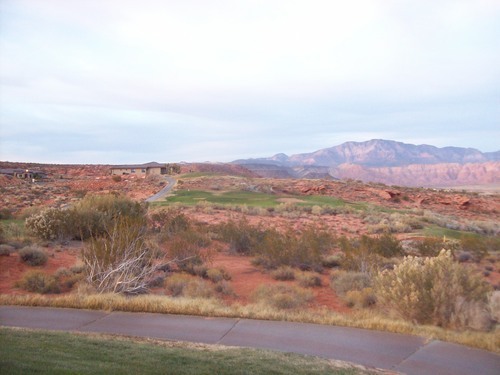 Again, when the St. George area scenery isn’t showing as well (as in the red rocks aren’t “glowing” in the sun like usual), I guarantee that takes away some of the appeal of this front nine. 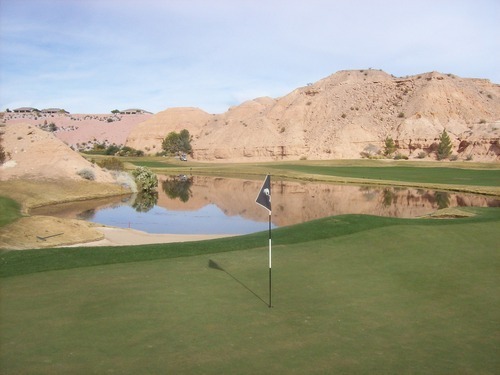 However, the 5th and 6th holes here did catch our attention. They both play over this rocky ravine that is very cool. 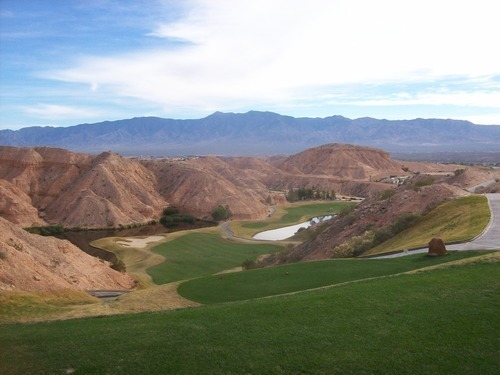 The 5th is a fun par-3 and then the 6th is a tough dogleg right par-4 with an intimidating approach shot over that ravine. 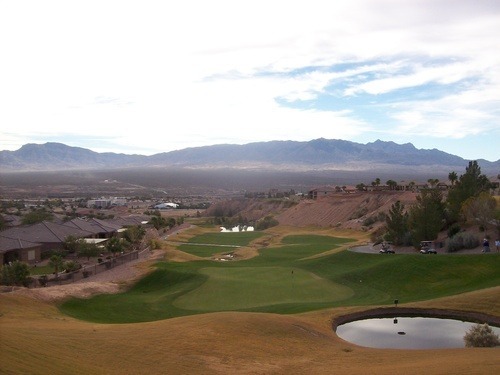 The back nine at Green Spring gets even more interesting with more hazard areas in play and hillier terrain. This is especially true on the closing stretch of 13-18, where it starts going up and down the hillside and the designs seem more distinctive. 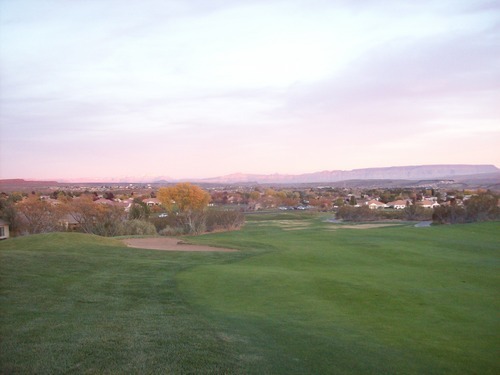 I was a little bummed it was getting so dark on these final few holes because my pictures really didn’t come out well enough to show their appeal. The course was in pretty solid shape. 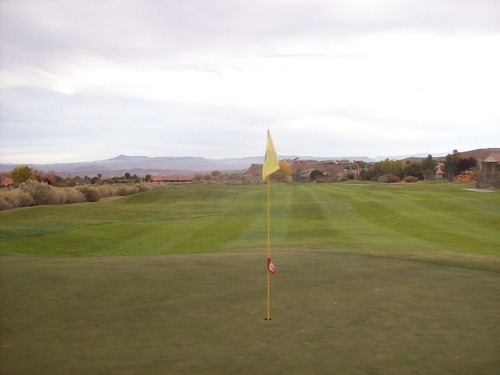 It was perhaps a little rougher around the edges this time of year, but it had good overall playability. The tee boxes and fairways were mostly lush and well kept. The rough was a bit more inconsistent, but again mostly pretty green throughout. 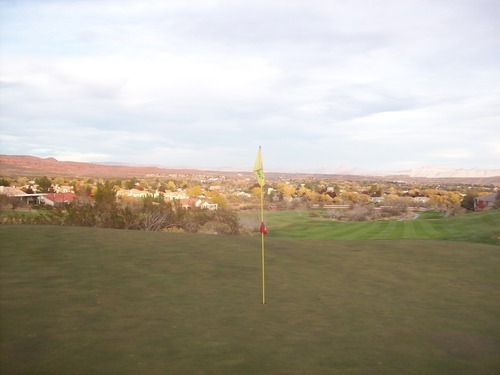 The greens had a dark, almost black-ish tint to them, but the surfaces were good. They were pretty firm and relatively slick on putts. They were very bumpy with spike marks that late in the day, but that’s to be expected. I wasn’t in a bunker, so no comments there. 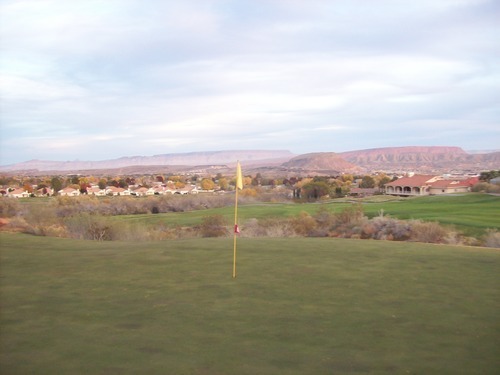 Green Spring is a solid course and another one to keep your eye on if visiting St. George for golf. 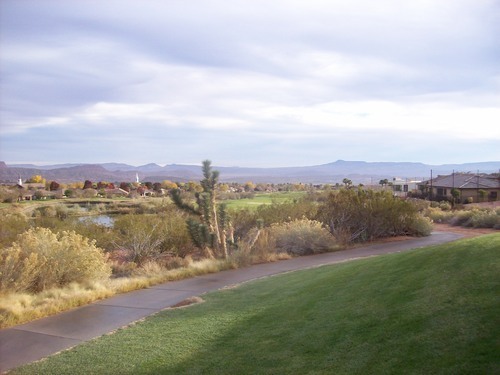 There are even more options here than in Mesquite, but between the two, there’s enough for several amazing golf weekends!